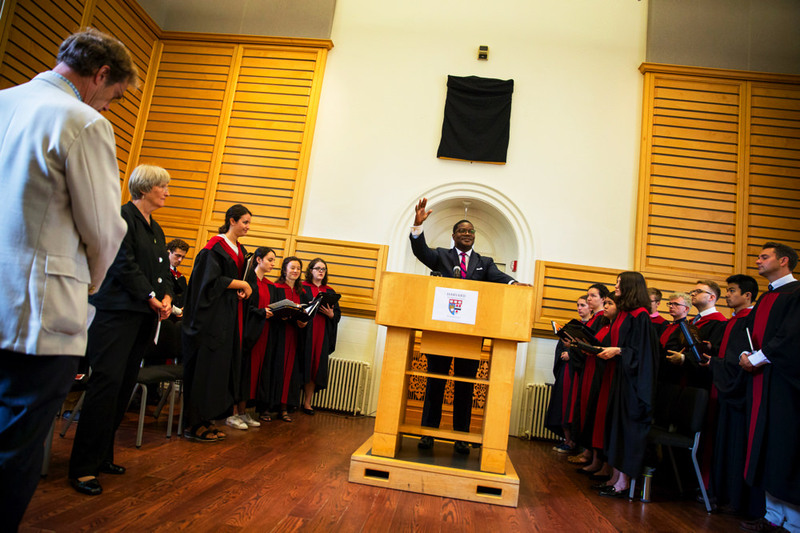 Pusey minister Jonathan L. Walton leads the Morning Prayers service, in its new location in Holden Chapel, as President Drew Faust, the speaker, and the choir look on. 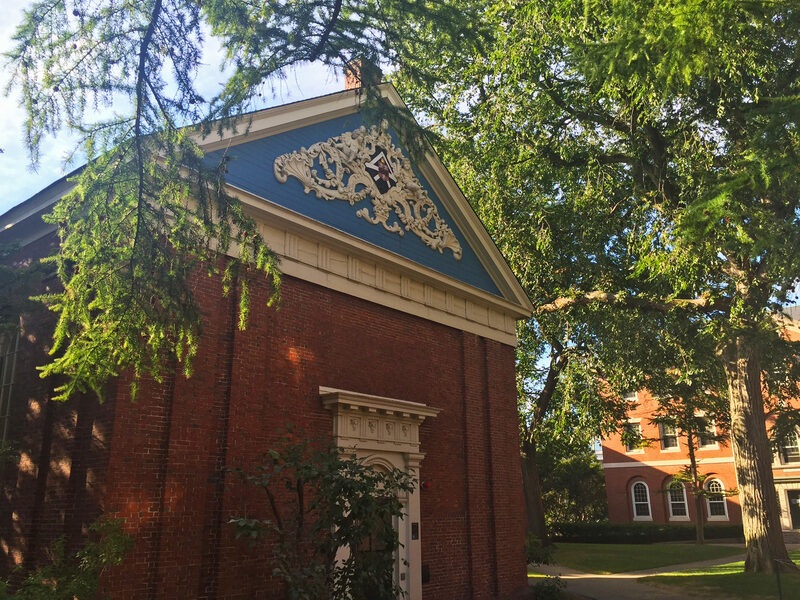 With Memorial Church closed for renovations , the venerable Morning Prayers service has relocated to Holden Chapel—temporarily returning that humble building, erected in 1742, to its short-lived original purpose (see below). The small portable organ, and the paper Memorial Church shield taped to the lectern, made it clear that this was a different setting—but the change to the less august venue in no way diminished the spirit and solemnity of the service. President Drew Faust, a self-identified “card-carrying” historian who likes to invoke the institution’s past on such occasions, did so in inaugurating the fall semester during her remarks this morning, the initial, semester-opening Morning Prayers, Diaspora Edition—but not by dwelling on the venue. Rather, on a high plane, she explored Harvard’s past in service to “a concern for the future”: a reflection, perhaps, on some of the disputes and differences about diversity and inclusion that arose in the prior year, when Harvard Law School students contested a school shield tied to a slave-owning benefactor ; when the University itself memorialized the enslaved persons who were in service to Harvard presidents  (Faust addressed both of these issues; see her remarks below); and when campus conversation focused on disturbing evidence of sexual assault , the status of (and proposed sanction of membership in) longstanding gender-exclusive social organizations ; and more. refocused our national attention on the unrealized promise of liberty and justice for all. And it put squarely in front of us the origins and implications of this national commitment. Conflicts over universities’ own histories became matters for scrutiny and debate on many campuses in the United States and beyond. Just as our nation since its beginnings has strived—and often struggled—towards a more perfect union and towards the promise of its founding, so universities like Harvard have moved steadily, if slowly, towards ever increasing openness, diversity, and inclusivity. But universities, too, were often historically rooted in contradiction and compromise, falling painfully short of fulfilling the commitment to human capacity and possibility that their dedication to the pursuit of truth should require. we must also confront more difficult and disturbing aspects of our heritage as well, aspects that will sober and even dismay us, but that will enable us to acknowledge the burden of our history and transcend it.…A true understanding of the past can disentangle us from lingering vestiges of harmful assumptions that may in hidden ways influence us still; we must understand how our narratives about the past have shaped and continue to shape the present in order to be able to transform that present into a better, juster future. We must seize the agency that the insights of history can provide us. In combination with her remarks at Freshman Convocation on the afternoon of August 29 , the president laid out an agenda for coming to terms with the assumptions and habits of mind that keep the University from fulfilling its inclusive vision, in a way that is constructively consistent with its commitment to discussion, discovery, and decisions about its path. For the historically minded: Morning and evening services moved from Holden Chapel to the more capacious chapel in the newest version of Harvard Hall when that building was completed in 1766, according to Bainbridge Bunting’s comprehensive Harvard: An Architectural History. That authority also reports that Holden subsequently became a Continental Army barracks during the American Revolution; a home for the College fire engine; and then the inaugural quarters of the nascent Medical School. President Faust’s complete text, as delivered, titled “Historians All,” follows. Good morning. Today we begin another academic year and launch ourselves into the future—the future of this 380-year-old institution and the futures of tens of thousands of us gathered here to learn together. But this morning I want to say just a few words about the past and about why I believe that a concern for the future requires us all to commit to exploring the past—to in some measure be historians. I am, in fact, an actual historian. Card-carrying, you might say. History has been my professional identity and my field of scholarly inquiry for many decades. History always seemed to me a rather noble endeavor so I was surprised when in 2007, after my appointment was announced, a number of people asked what being a historian had to do with being president of Harvard. I thought it a curious question—not just because historians have been successful presidents of lots of things, including Harvard—but because studying history seemed to me to be in many ways the ideal training for leadership. History, like leadership, is about change, about understanding what makes change happen, about who embraces it and why, and about who resists it and how. I also believed that studying history had given me at least two other important habits of mind. One was an appreciation of contingency. When you explore the past, you recognize that things could have been otherwise. For me, that realization brought with it a sense of opportunity: we have the power to make things otherwise. History imbues us with agency and with possibility. But I also derive from history a sense of profound humility—in face of what others have confronted in our differing circumstances but common struggle to chart a path through a challenging world. Studying history has diminished my eagerness to judge or condemn people—in the past or present—and has enhanced my desire—and I hope my capacity—to understand, to see the world through others’ eyes. Viet Thanh Nguyen, a Pulitzer Prize winner and a former Radcliffe fellow, has written a very powerful book that I read this summer, called Nothing Ever Dies, about the history and memory of what we in the United States call the Vietnam War. Confronting difficult truths from the past, he argues, is essential to understanding the present and acting ethically within it. He writes, and I quote him, “Reminding ourselves that being human also means being inhuman is important simply because it is so easy to forget our inhumanity or to displace it onto other humans….If we do not recognize our capacity to victimize,” he continues, “then it would be difficult for us to prevent the victimization carried out on our behalf, or which we do ourselves.” For me, recognizing the shortcomings of the past has served as a compass to steer towards a better future. In the past year or so, history suddenly took center stage at many universities, as our institutions became swept up in larger forces of controversy and demands for social change. Ferguson, Charleston, Staten Island, Baltimore, Orlando, Baton Rouge—far too many places and tragedies to list—all refocused our national attention on the unrealized promise of liberty and justice for all. And it put squarely in front of us the origins and implications of this national commitment. Conflicts over universities’ own histories became matters for scrutiny and debate on many campuses in the United States and beyond. Just as our nation since its beginnings has strived—and often struggled—towards a more perfect union and towards the promise of its founding, so universities like Harvard have moved steadily, if slowly, towards ever increasing openness, diversity and inclusivity. But universities, too, were often historically rooted in contradiction and compromise, falling painfully short of fulfilling the commitment to human capacity and possibility that their dedication to the pursuit of truth should require. We at Harvard often look to the past to inspire us. But we must confront more difficult and disturbing aspects of our heritage as well, aspects that will sober and even dismay us, but that will enable us to acknowledge the burden of our history and transcend it. We as a community undertook some of that work last year with an exploration of the history of slavery at Harvard Law School and with a plaque to memorialize the lives of four enslaved persons who worked in the households of two Harvard presidents. This year the work will continue, among other ways, with a Radcliffe conference on slavery and universities. A true understanding of the past can disentangle us from lingering vestiges of harmful assumptions that may in hidden ways influence us still; we must understand how our narratives about the past have shaped and continue to shape the present in order to be able to transform that present into a better, juster future. We must seize the agency that the insights of history can provide us. We must all be historians. Who we are is indelibly shaped by who we have been. In William Faulkner’s oft quoted words: “The past is never dead; it’s not even past.” It is instead the essential material with which we can build a better future.